Words have never quite worked for me as a means of expression, instead it has been wood carving. 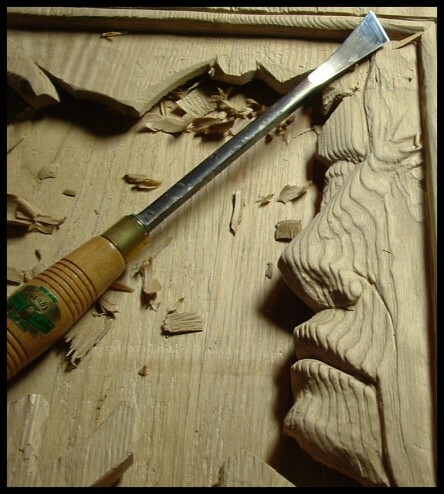 The carving becomes a communication between me and the wood as I am seduced by the feeling that, maybe this time, I will be able to express the conversation clearly. These are the words not spoken; truly “Beyond Words”. So it is difficult to write about my ‘book’ which reflects my emotional journey through life; a journey which, like everyone else’s personal journey, changes direction with each choice I make. The wood chosen for this piece is a combination of ash and butternut. The ash used for the outside cover is strong, pliable, rich in grain and emotion, and reflects our traditional past. The butternut I chose for the interior of the book shows both warmth and beauty, while evoking feelings of love. I found myself engaged in the grain and shape of the wood, expressing with every cut the emotions I felt. Please read the emotions from the wood, feel the words through touch, and listen to what it says as you explore the story for yourself. My journey is primarily a search, to discover a life of love. I travel with many guides and teachers, some of whom are my closest friends. To them, I would like to say thanks for their guidance, patience, direction and love. To God, who is teaching me about unconditional love, thank you for the courage to share my journey with others. A travelling exhibition of hand made “books” – Beyond Words, is the work of nineteen celebrated regional artists: Jim Boyd, Linda Brine, Darren Byers, Brigitte Clavette, George Fry, Toby Graser, Fred Harrison, Susan Vida Judah, Suzanne Hill, Kathy Hooper, Sue Hooper, Elma McKay, Andrea Meeson, Brian Meeson, Alison Murphy, John Murphy, Peter Powning, Karen Shackleton, Peter Thomas, which will travel to Fredericton, Moncton and Halifax over the next few months. The exhibition Beyond words is a challenge to conventionality. Verbal language has powerful links to our conscious and subconscious selves, and as such may function as a means of manipulation and constraint, imposed on us by others, or springing from ourselves as a means of self-justification. Too often words inhibit the primal response, the genuine impulses we experience before we crush our feelings into constructed language. Thom Gunn refers to “the dark before of truth”. Love, instinctive kindness, deep fears are not created because we articulate them, but rather arise in a current of emotional honesty. All the works in this exhibit explore the concept of ‘book’ from that deep current which exists within us and which defies the constraints of ‘word’. Our deepest and truest response is not linguistic, it is sentient, direct; it is, ultimately, wordless.